Bob has been writing about Art Tatum, the great American jazz pianist of the 1930s and 40s. Bob managed to find some transcriptions of Tatum’s piano solos in the library, and has been listening to Tatum’s recordings of those very pieces, comparing the recording with the transcription. I listened too because I’ve long been a fan of Tatum’s. Tatum was blind, or virtually blind. One might think that this made it harder to play the piano fast and accurately. Yet his piano technique is defined by something very rare: a sense of absolute security in the way he moves about the keys. I’ve often wondered whether his sureness of touch was because of, and not despite, his blindness. Most pianists occasionally stumble over notes, and it may be because their faculty of sight is mis-applied for a split second. They forget to look at the keys and miss a jump, or they look in the wrong direction at a moment when they’re used to locating a particular note by sight before they play it. They know where notes are partly by sight and partly by ear. When they take their eyes off the keys, one of these steering devices is lost, leaving them momentarily rudderless. Art Tatum, on the other hand, couldn’t use sight to find his way about the keyboard. He seemed to possess an exact and detailed internal map of the piano’s geography. Everyone who saw him play said that he moved very little, keeping his body still and just moving his hands about the keyboard, so fast that even high-flying pianists were bemused. His fast runs are still dazzling to listen to, and not just because we know they were improvised; it’s because of the mesmerising assurance of his touch. When you hear Tatum play, you get the feeling that he doesn’t have to calculate or measure where the notes are; he just knows. His technique is fundamentally different to that of most sighted pianists. An interesting comparison can be made with the 20-year-old blind Japanese pianist Nobuyuki Tsujii who has just won joint first prize in the Van Cliburn piano competition. At the piano, he too has a rare security which is stunning to watch. People sometimes ask where they can find my 1990 disc of piano music by Billy Mayerl, and I haven’t been able to tell them. Since Virgin Classics was bought by EMI, and after parts of EMI were moved to Paris, it’s become very hard to follow the fate of a record which has seemed to go in and out of print. Anyway, my ‘Loose Elbows’ disc is now available to order through Arkiv Music. You won’t find it in the shops, but you can order a copy of the disc here. If you don’t know Billy Mayerl’s music, I highly recommend it. Billy Mayerl was the wonderful pianist at London’s Savoy Hotel in the 1920s and 30s. His virtuosic light music was famous in its day. Next week my album will also become available as a digital download and from iTunes. I’ll give the links when I receive them from EMI. 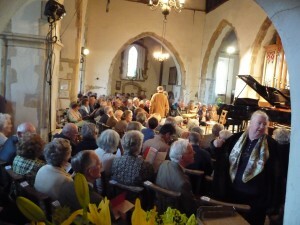 We’re just back from the Florestan Festival at Peasmarsh. What an extraordinary thing a festival is. A few hours before the first concert, the church is completely quiet, the country lanes are empty, and you can’t imagine that anyone will really come. You finish the rehearsal feeling almost despondent. All those weeks and months of preparation: will it all be wasted? All of a sudden, cars arrive in the lane, the churchyard fills up with people, people spread their picnics under the trees, dinner is served in the catering tent, a coffee stand is set up on a stone monument, and the festival is off. It remains a little hub of activity for four whole days, all kinds of people ‘playing their part’ in every sense. You never know who you’re going to bump into and what interesting things they’ll say. I just wish I had a little more time to sit on the grass and chat, but with all our rehearsals and concerts there isn’t much spare time. I don’t know what the festival means to our listeners, but for me the best thing about the festival is the quality of their attention. These days, audiences in other places are often rather free with their coughing, fidgeting and rustling, as though they are so used to hearing music via iPod and radio that they don’t realise there are live musicians in front of them. Bursts of uninhibited coughing can be very distracting, to say the least, when you’re trying to concentrate. In Peasmarsh, on the other hand, it seems that our audience has magically banished all coughs and colds. They’re completely silent during our concerts, but not in a passive way; they seem to create a force field of attentiveness which inspires the musicians to play better. It’s clear to me that their ‘active listening’ is an essential part of the whole event. Despite this week’s rehearsals for the Florestan Festival I’ve managed to watch several rounds of the BBC Cardiff Singer of the World Competition on television (the Final is on Sunday). I’ve been following this bi-annual competition for many years and always find it fascinating. So many different artistic styles from different countries, so many approaches to self-presentation and image. Each night there are experts whose professional opinion is sought, and members of the public whose reactions are canvassed. The experts always say that they’re looking for someone whose heart and soul shows in their singing, someone who can ‘communicate’. Members of the public say the same thing. But, actually, there are plenty of competitors whose heart shows in their singing, or who communicate well with the audience, but who can’t quite match their ardour with sheer vocal technique. In such cases, the experts are quick to point out the shortcomings. There are also singers who, as Penny Smith memorably said the other night, adopt the Highwayman approach to singing an aria – “stand and deliver!” In those cases, where technique is at the forefront, the experts lament the lack of expressive involvement. What we’re all hoping for, I suppose, is someone who combines superlative vocal technique with deep musicality, acting ability, expressive power, integrity, a pleasing face and an acceptable approach to fashion. Despite today’s skilful and methodical approach to preparing for competitions, the combination remains rare. Yet I feel I’ve seen several examples during the first three rounds of the competition, making it a true pleasure. Roses have started to bloom in the garden. There’s an old rosebush which has been living here for longer than I have. 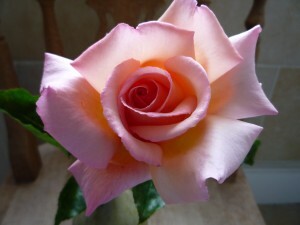 Its roses are pale pink, but this year for the first time the petals are tinged with the faintest gold. Maybe the weather is different this year, or it’s something to do with the compost Bob has been putting on the garden. Either way, the pink-gold roses look unusually nice.